One of the worst things you could have happen to you this holiday season is a heating system failure. Just picture it: You’re nice and cozy on your couch enjoying some hot chocolate while watching a Hallmark holiday movie when all of a sudden, you hear some clunky noises, and it gets extremely cold. You know you should’ve replaced your heating system a while ago, but it had been working just fine. 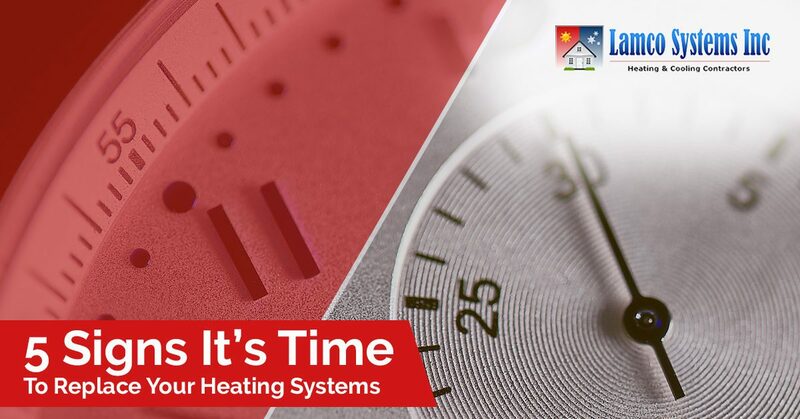 In today’s blog post, we’ll provide you with five common signs that it’s time to replace your heating system so you never find yourself in this unfortunate situation. If you’re looking for someone to check on your heater, repair it or install an entirely new one, our team at Lamco Systems, Inc. is the team for the job. Our HVAC contractors offer some of the best heating services in Merrimack Valley. Contact us today to get a free quote. Continue reading below for five signs that you should probably check into replacing the heating system in your home. If your heating system is properly taken care of, it should last you anywhere between 16 and 20 years. When your heating system approaches this age, start shopping around for a new one. Not sure how old your furnace is? Simply check the sticker on the inside panel for its date of manufacture. 2. You notice you’re having to repair it more frequently. Do you find that you’re calling your local HVAC contractors more so than usual? Repair costs can add up quickly. It might make more sense to look into a new heating system that gives you minimal issues rather than always repairing your old one. 3. It’s making strange noises. Your heating system shouldn’t be making clunking, banging, rattling or squealing sounds. If it is, have a professional take a look at it — it may be time for a replacement. 4. Your energy bills are on the rise. Are your utility bills a lot higher than they once were? As heating systems grow old, they tend to become less energy efficient, as they have to work much harder to do the same job they once did. Ultimately, this means your bills will be significantly pricier. Looking to save on your heating bills this winter? Check out our recent blog post for additional tricks and tips! 5. Some of the rooms in your home are colder than others. If you notice that it takes a lot of time to heat certain areas of your home or that some rooms are just always colder than others, you might need to look into investing in a new heating system. Are you looking for HVAC contractors in Merrimack Valley that you can trust with your heating system? At Lamco Systems, we have experience working with an array of heating systems, including furnaces, boilers, heat pumps and more. With more than 50 years in the heating business, we know we can provide you with the most efficient, high-quality heating services in the area. For more information or to schedule a heating service, contact us today. You can reach us by calling (978) 674-8837 or by completing our online form.